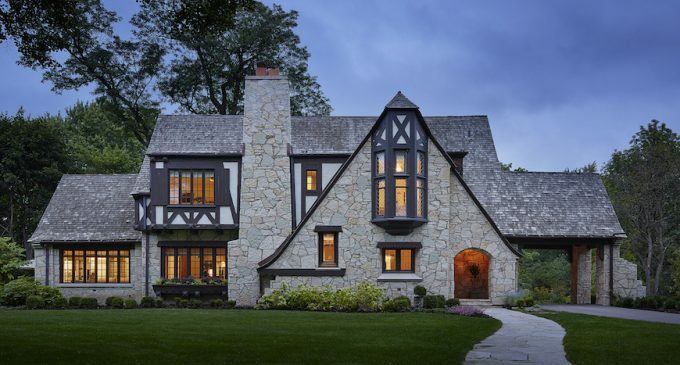 An iconic Tudor mansion designed by famed architect R. Harold Zook in 1927 has had its interiors reimagined by Michael Abraham Architecture. Following the extensive transformation, the 6,600 square foot home hit the market in May of 2017 for $4,100,000. It’s just been reduced to $3,699,000 and is currently labelled as pending sale. According to the listing, the home was taken down to the studs and exquisitely updated with a younger and more contemporary interior. We’ve included a selection of before and current photos below. The listing also notes that the gourmet kitchen was personally designed by Mick De Giulio. There are 7 bedrooms and 8 bathrooms throughout, as well as interior stone walls, hand-hewn beams and a 10 foot basement with glass wine cellar and smoking lounge with wood panelled walls and leather bar. The home sits on a 0.61 acre corner lot and comes complete with a lovely carriage house. It’s on the market for $3,699,000 with Berkshire Hathaway.